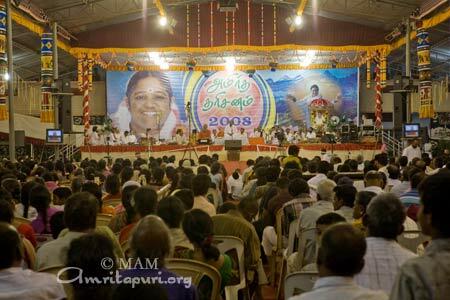 Amma held her first public program in the city of Tirunelveli, in southern Tamil Nadu. 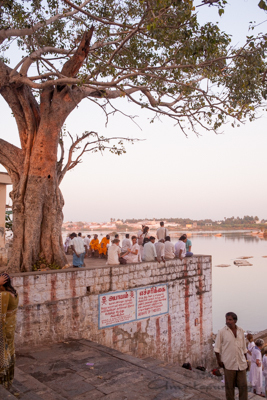 This district is well-known for its diverse landscapes; it contains everything from deserts, forests, rivers, mountains, to sea coasts. 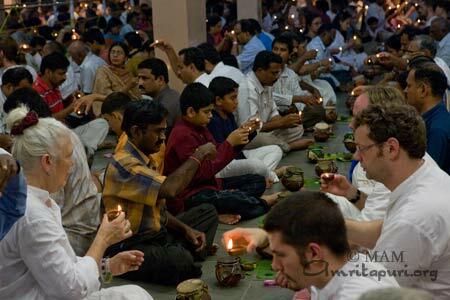 The name ‘Tiru-nel-veli’ means ‘sacred fenced paddy.’ One of the ancient stories is that a devotee of Shiva was starving, living off of mere paddy that he begged. 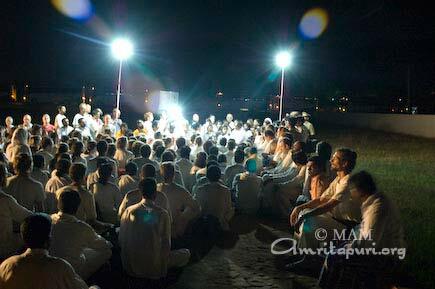 When he went to offer his worship to the Sun, praying for rain, a massive downpour ensued. 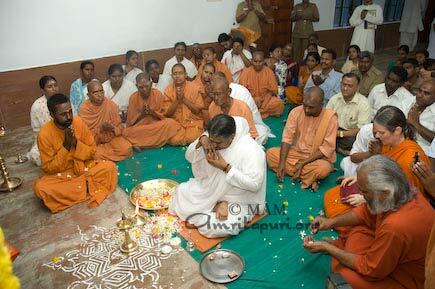 However, the paddy that he laid down didn’t become wet. 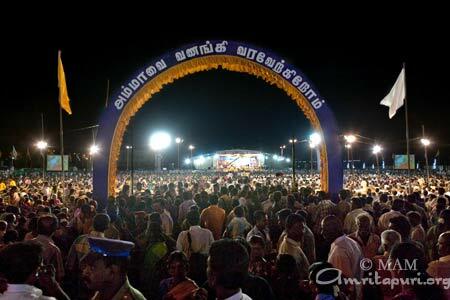 Thus came the name ‘Tiru-nel-veli.’ In Tamil this place is known as Nellai. 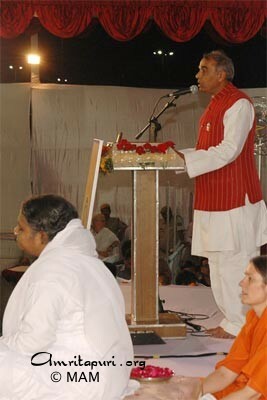 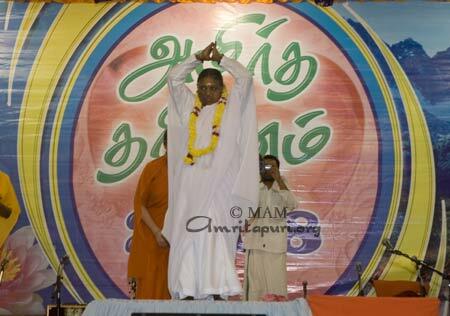 The welcome address of the program was given by Swami Shankarananda of the Ramakrishna Tapovanam in Tiruchi. 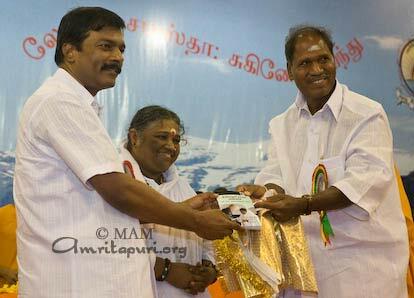 The mayor of Tirunelveli, Mr. A. L. Subramaniam, and member of parliament Thanushkodi Adityan gave speeches about Amma’s humanitarian activities. 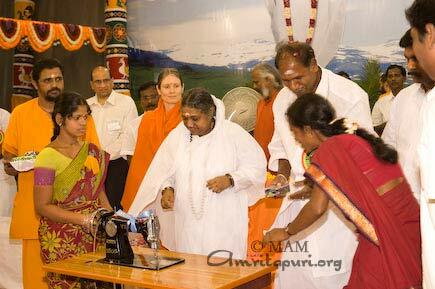 Sewing machines were distributed to ten impoverished villagers from the area. 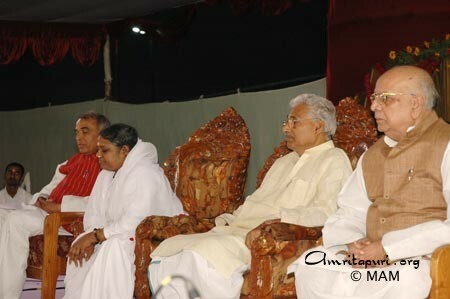 Other distinguished guests included M.L.A. 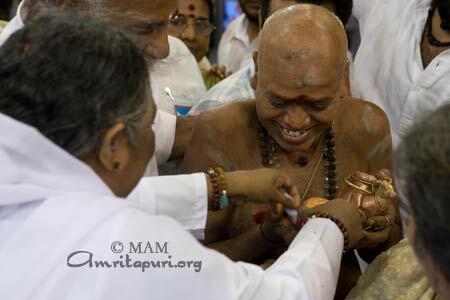 Mr. N. Malai Raja, Mr. M.N. 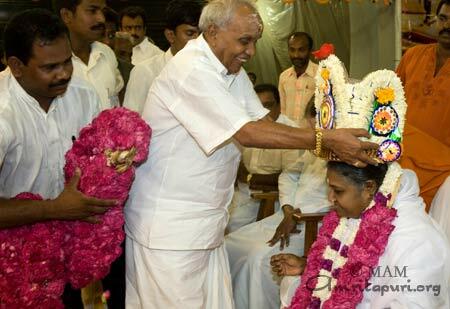 Manjanatha I.P.S., District Judge Justice Bhaskaran, Nellai District Police Joint Commisioner Dr. Dhinkaran, and Nellai District Police Joint Commissioner Mr. T. Jayachandran. 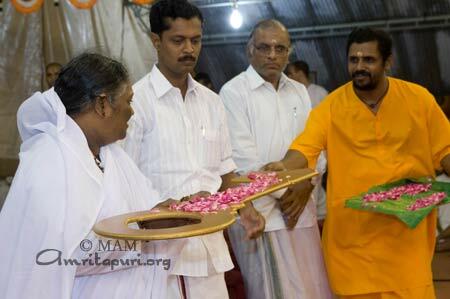 After a long darshan, Amma will travel to the last stop of this leg of Bharata Yatra, which is Trivandrum. 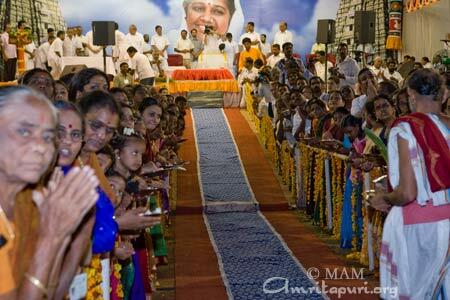 Amma held her first public program in Kumbakonam, Tamil Nadu. 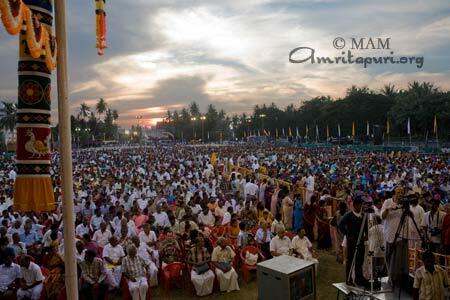 The program was held on a huge Banadurai Higher Secondary School grounds, capable of holding tens of 1,000’s of people. 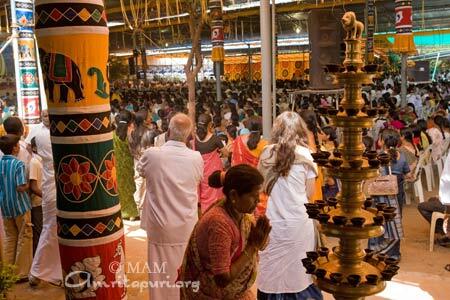 In July of 2004, a disastrous fire took place in this city. 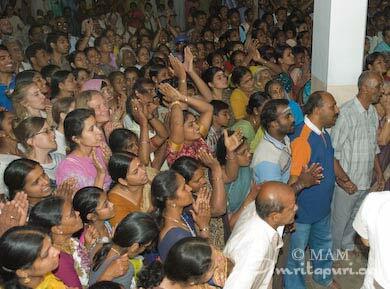 The fire was in a school, and many children were trapped inside, unable to escape. 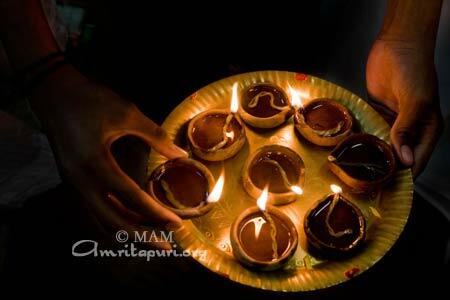 Those who did survive were left with very severe burns, and some children had burns all over their body. 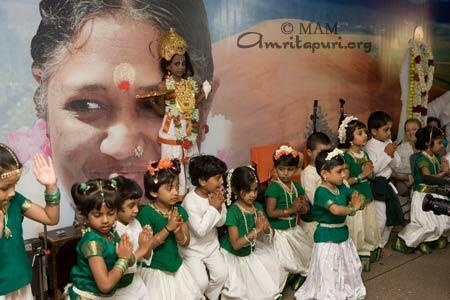 The children who survived had an intense fear of fire. 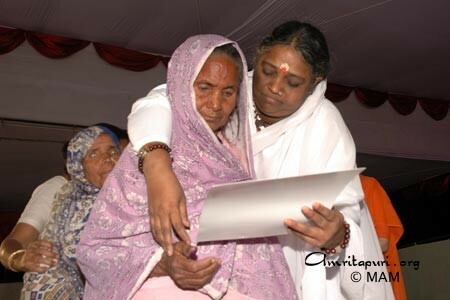 If their mothers tried to turn on a stove to cook, they would immediately go and turn it off. 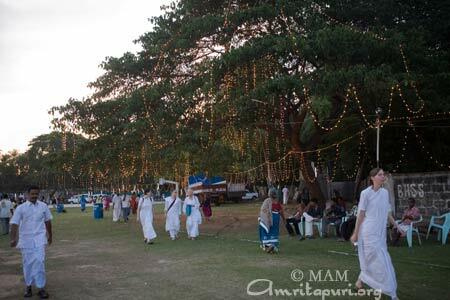 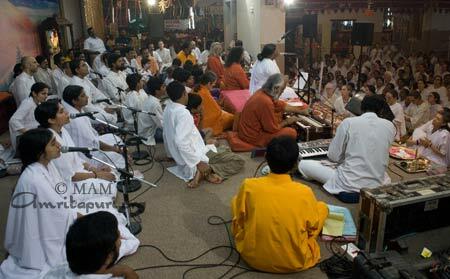 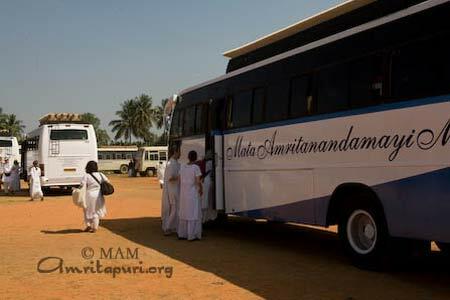 An interesting fact is that at the time when these children came to Amma with a fear of fire, the children from the coastal region near the ashram were overcoming their own fear of water, caused by their experiences in the tsunami. 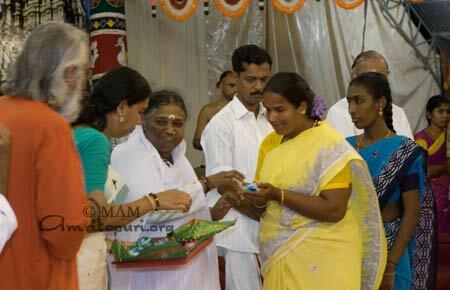 In the public program here today, one could see the expression of Amma’s support, as Amma handed out the keys to ten newly built houses to poor families that were affected in the tragedy. 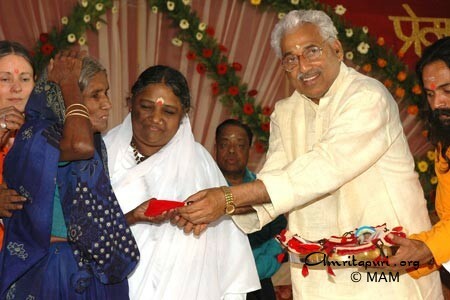 Tamil Azaghan, the chairman of Kumbakonam Municipality, handed over the keys of the new houses to the recipients. 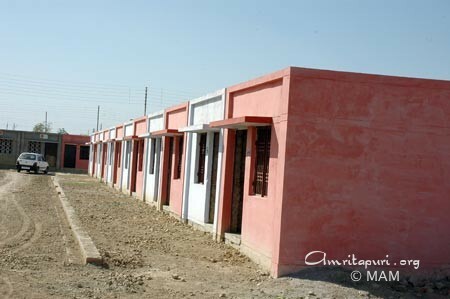 This is part of a scheme to build and distribute 51 houses for the families affected by the fire. 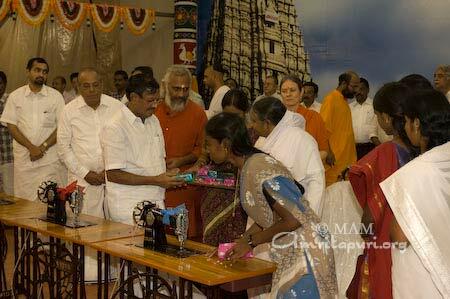 Sewing machines were also distributed to ten poor women from the area, in order to help them earn a livelihood. 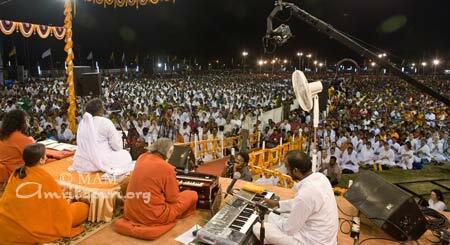 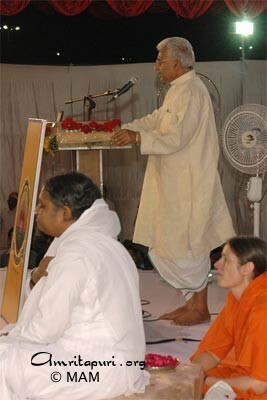 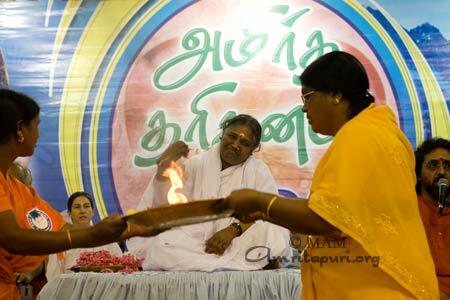 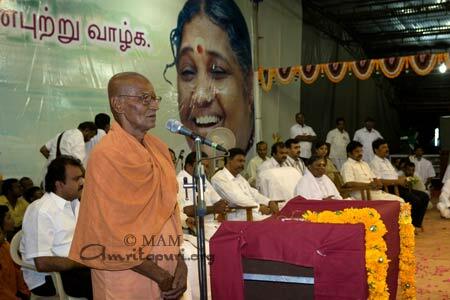 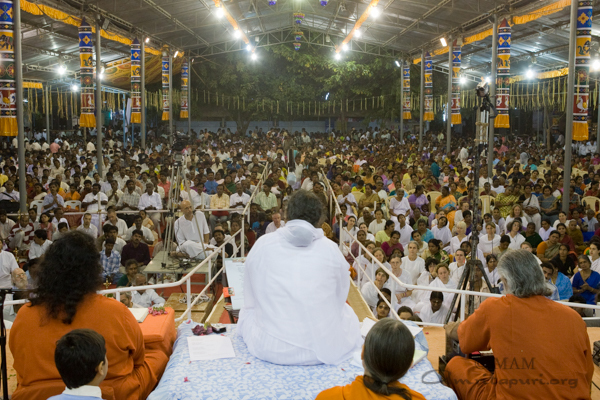 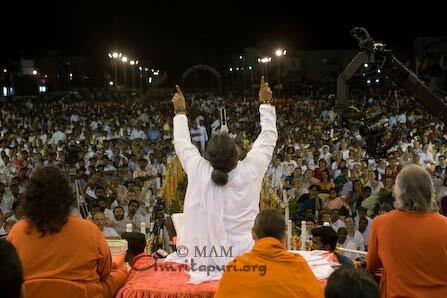 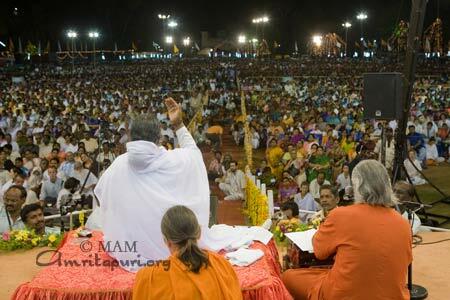 Amma held two days of programmes in the Chennai Brahmasthanam. 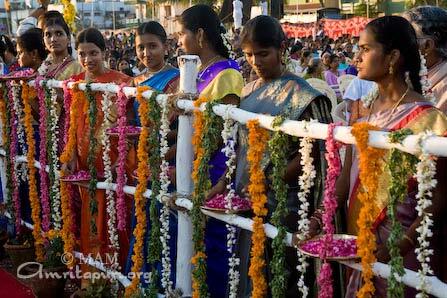 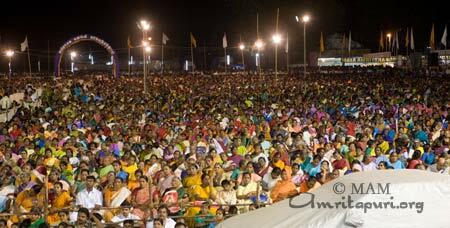 The crowd overflowed the small Brahmasthanam grounds on both days, as the people continuously filed in from the busy streets to have darshan. 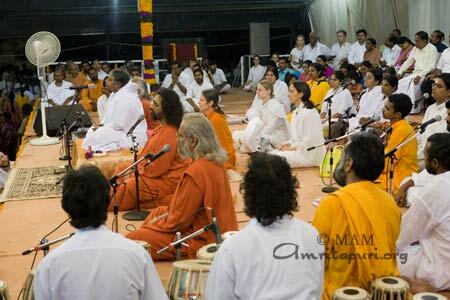 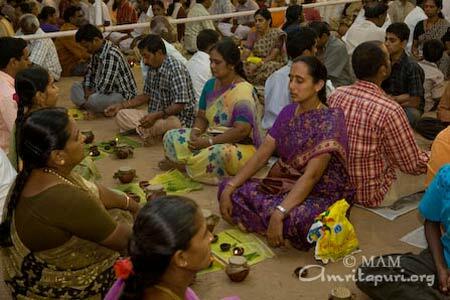 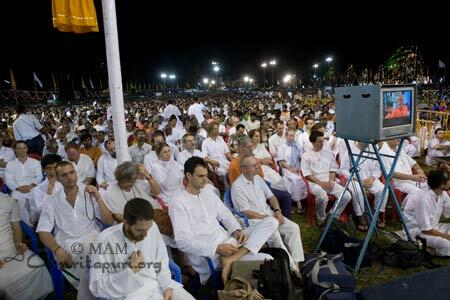 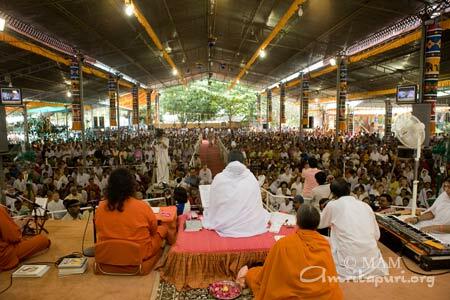 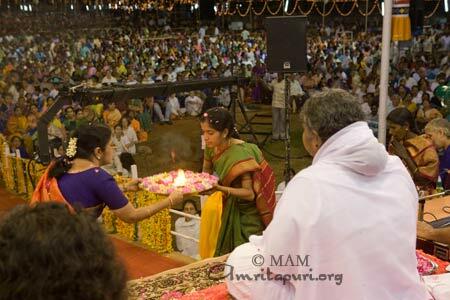 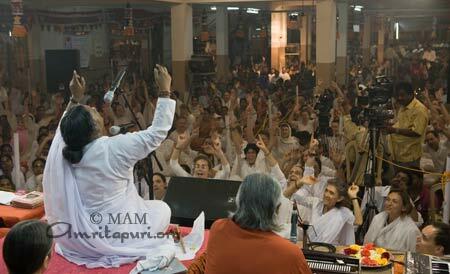 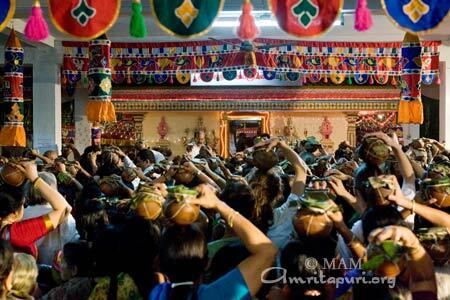 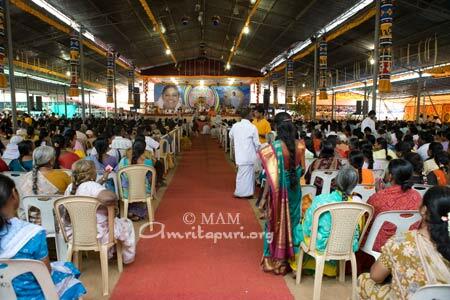 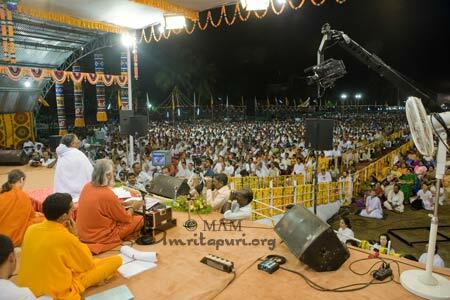 On the second day, mass pujas were performed, led by Amma herself. 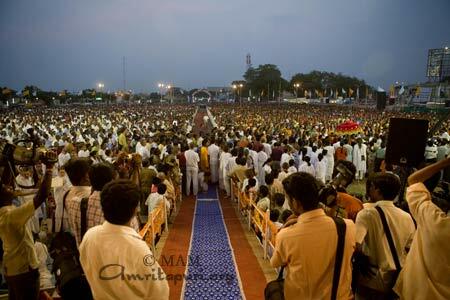 Chennai is one of the biggest cities in Tamil Nadu and is also home to a major film industry. 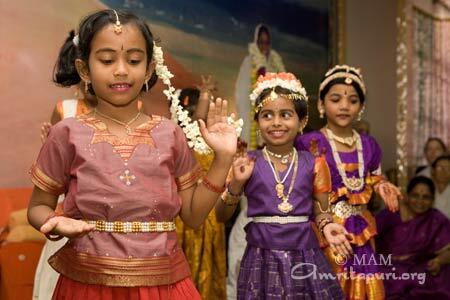 Chennai is considered the Bollywood of South India. 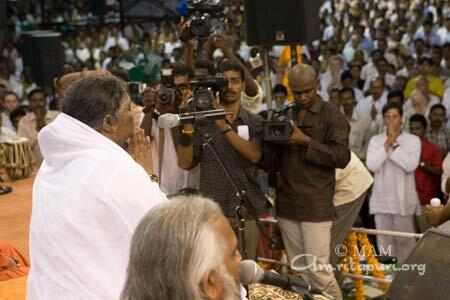 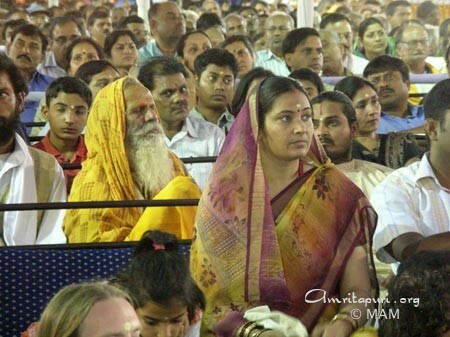 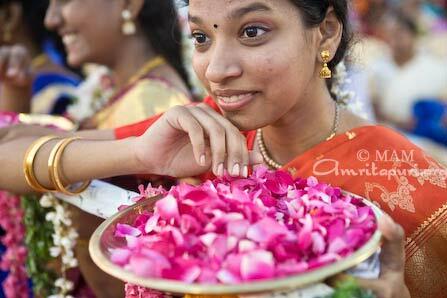 A few celebrities made appearances at the brahmasthanam festival. 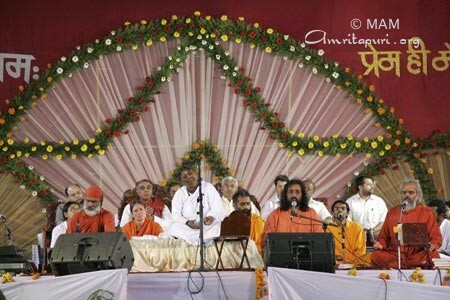 K.S Chitra, a famous singer came and sang Krishna bhajans on the stage. 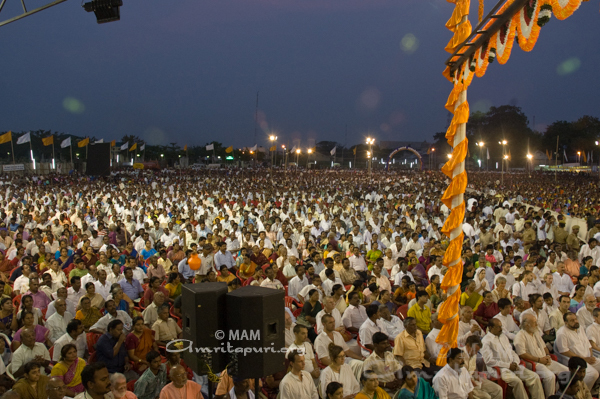 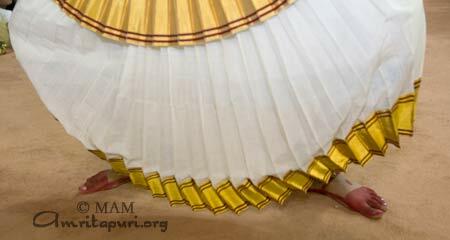 At the end of the second day’s darshan, Amma fulfilled the hopes of Chennai devotees by singing ‘Mata Rani.’ The hall blasted with the chorus, ‘Mata Rani Ki Jai,’ as Amma stood and exited the stage, off to the next program. 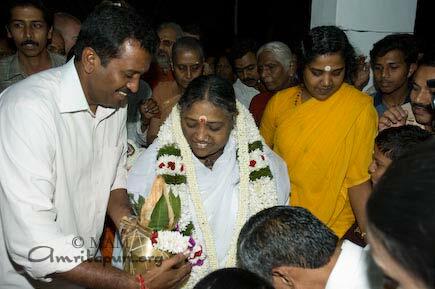 Amma came from Puducherry, and after these Chennai programs, she is heading to Kumbakonam. 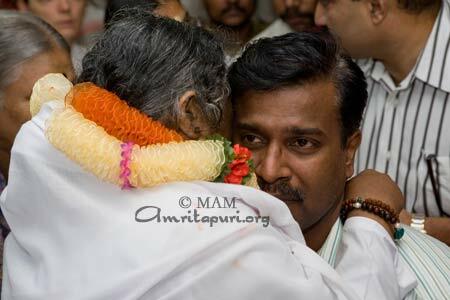 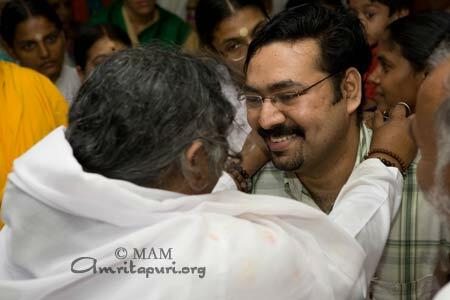 But for Amma, it is only like going from one room of a house to another room. 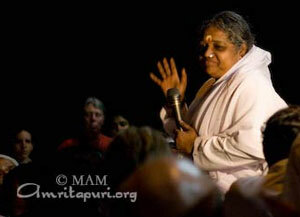 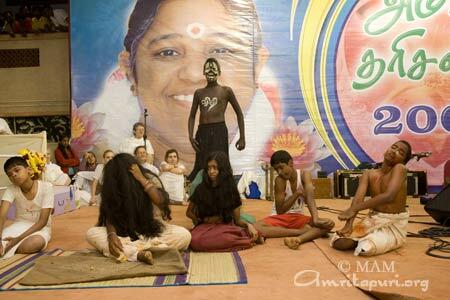 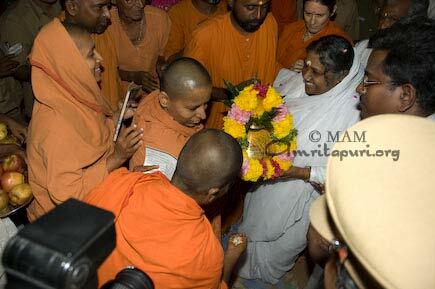 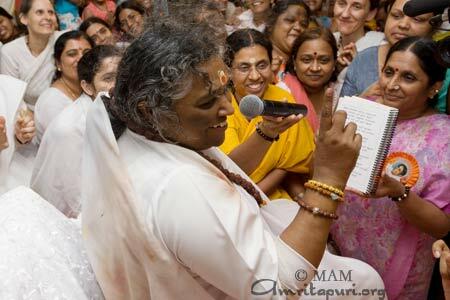 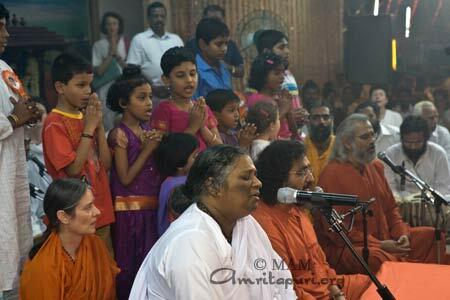 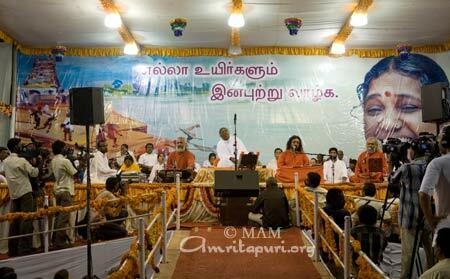 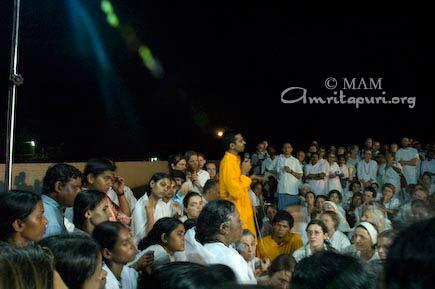 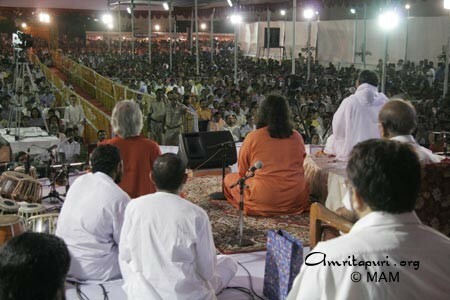 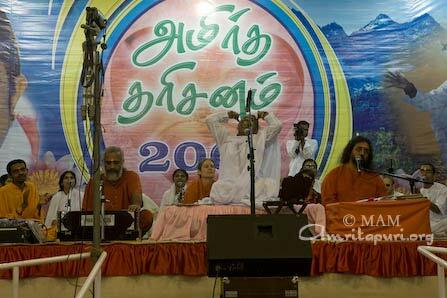 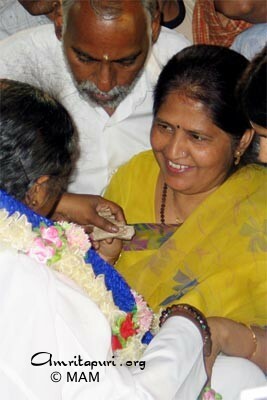 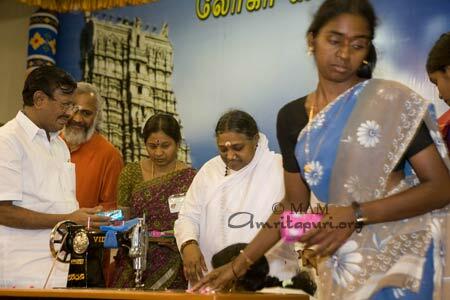 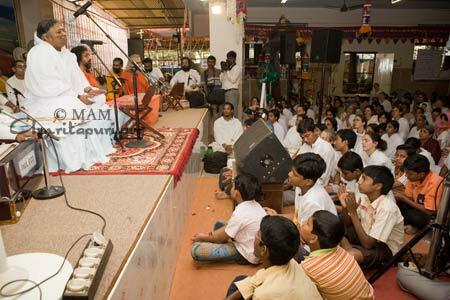 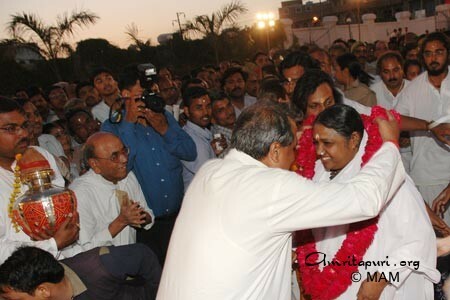 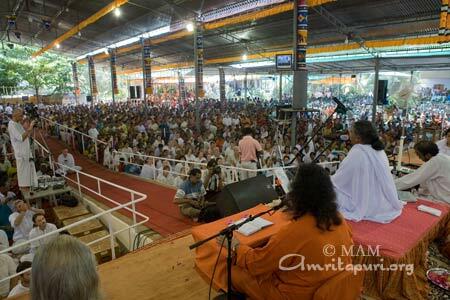 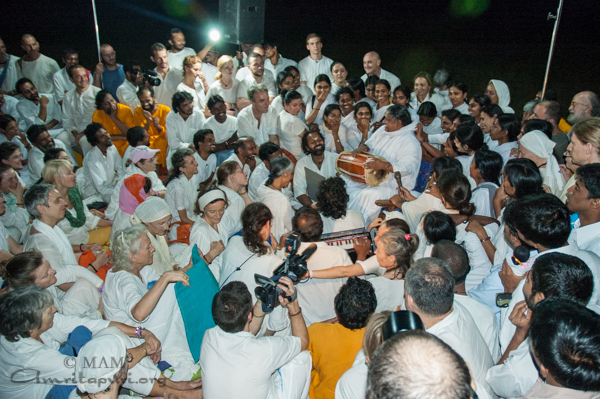 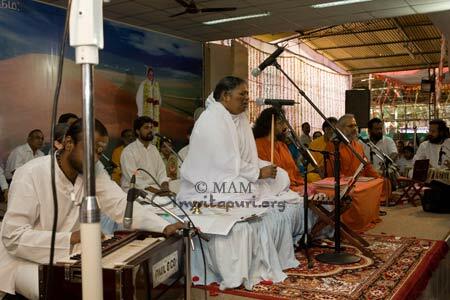 In between Chennai & Kumbhakonam Amma stopped with the tour group in Cudallore for Meditation & Bhajans. 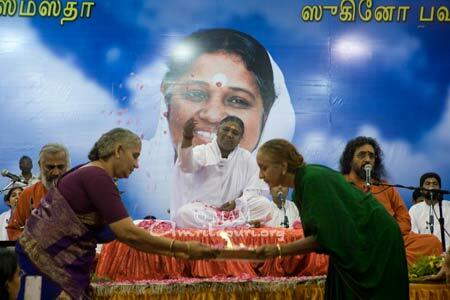 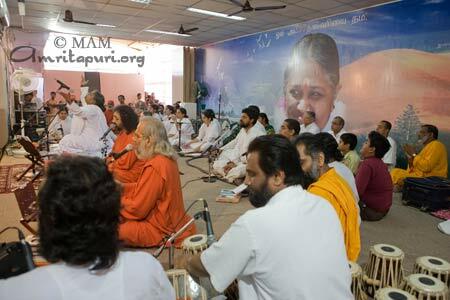 Amma held two days of program in Chennai. 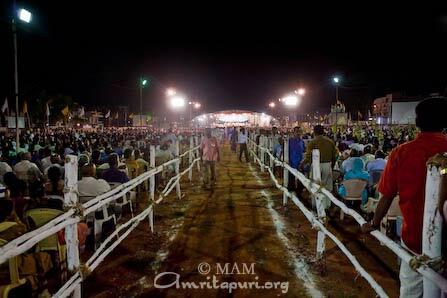 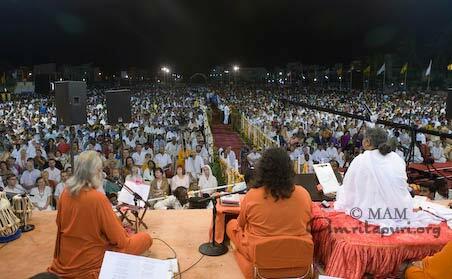 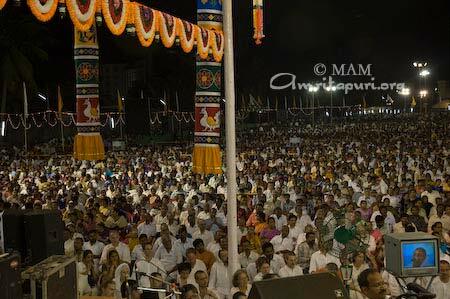 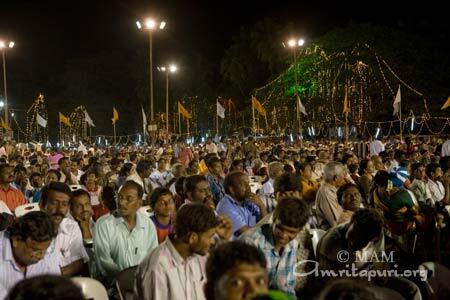 Amma visited Puducherry (formerly named ‘Pondicherry’) for an evening public program on the 21st. 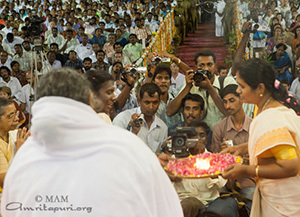 The program was attended by many respected dignitaries, including the chief minister of Puducherry, Sri N. Rangaswami. 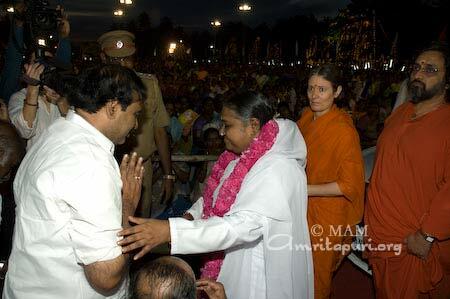 The chief minister expressed his wish for Amma to become more active in the state. 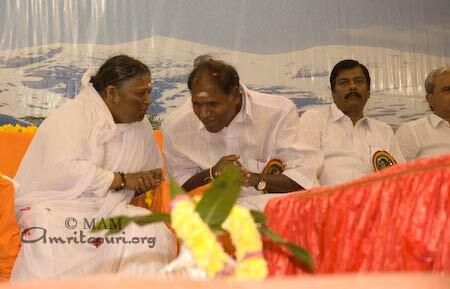 Other guests of honor included the Puducherry industries and power minister, Sri V. Vaithilingam, the Puducherry education minister Sri E. Valsaraj, the Puducherry tourism minister Sri M. Kandaswami, and the Puducherry deputy speaker, Sri A.V. 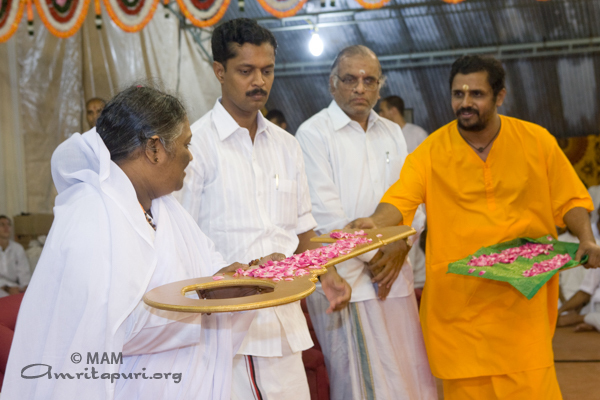 Sreedharan. 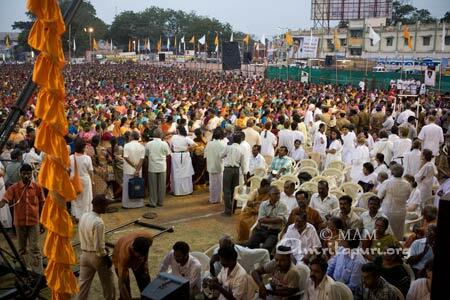 The program was held at the Venkata Nagar Thidal, an open grounds. 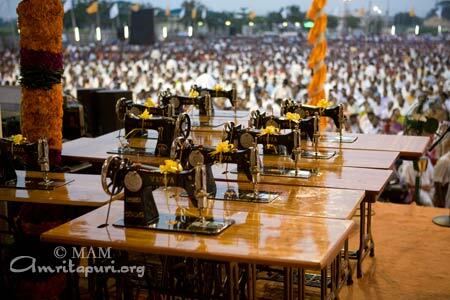 Ten women were given sewing machines by the Chief Minister N Kumaraswamy to improve their ability to earn a living. 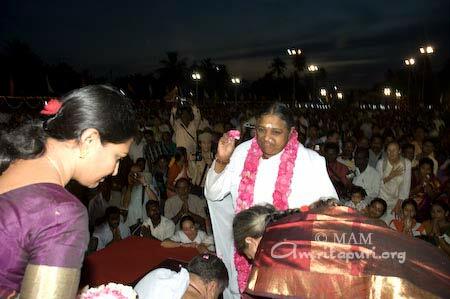 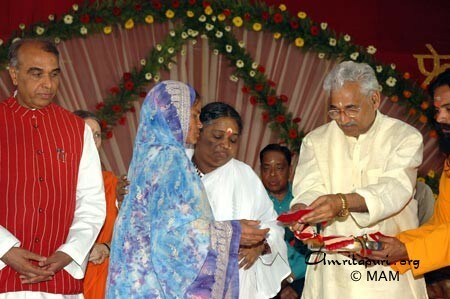 Amma’s speech upon receiving the Cinema Verite award in Paris 2007 was translated into Tamil and was released by the Education minister Sri E. Valsaraj giving a Copy to the Chief Minister. 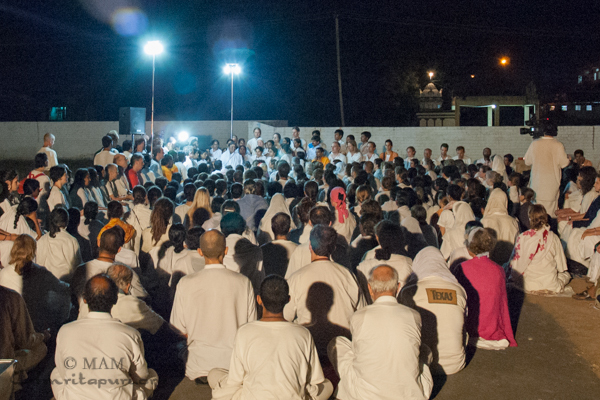 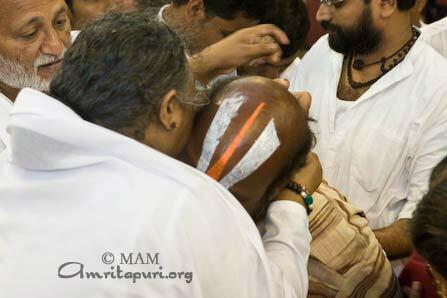 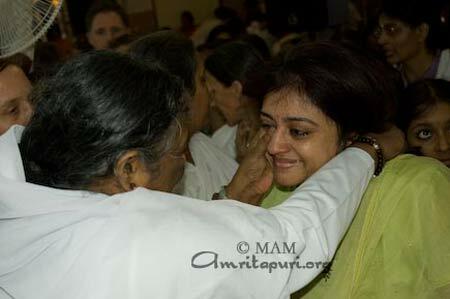 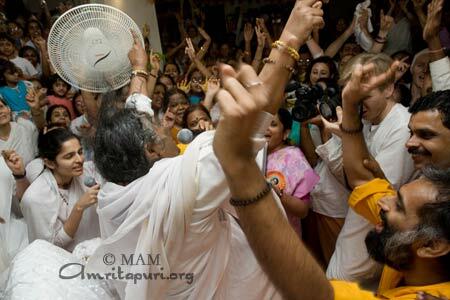 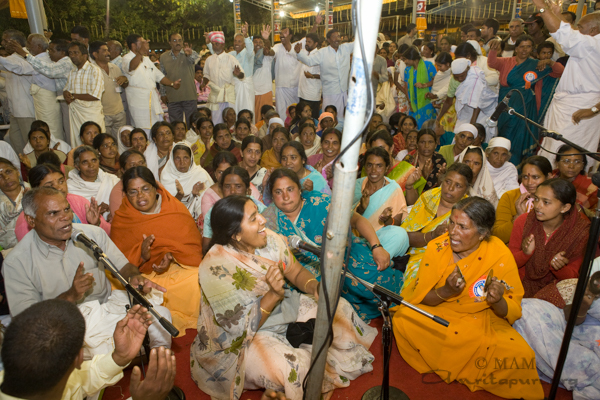 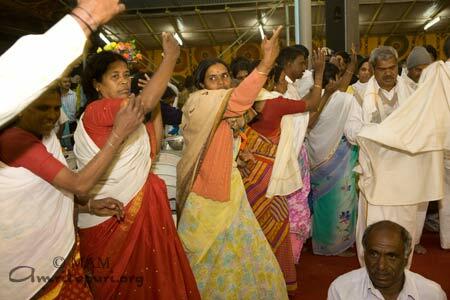 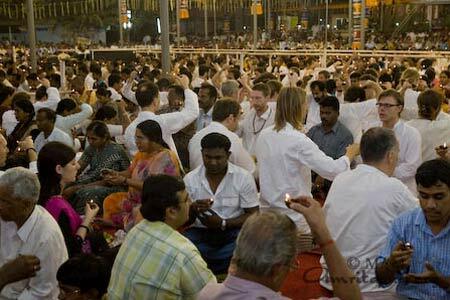 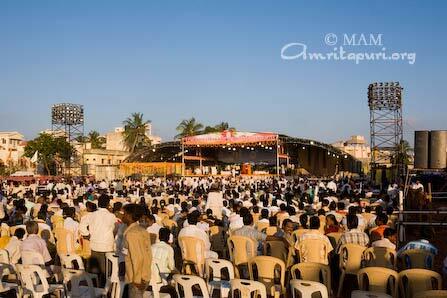 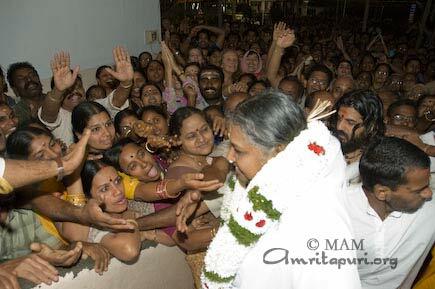 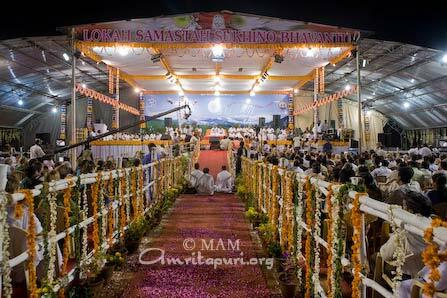 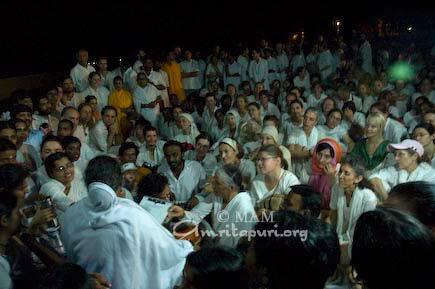 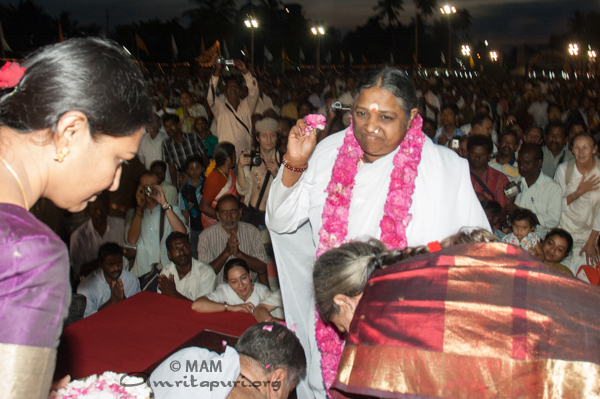 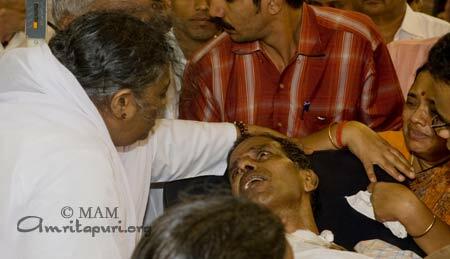 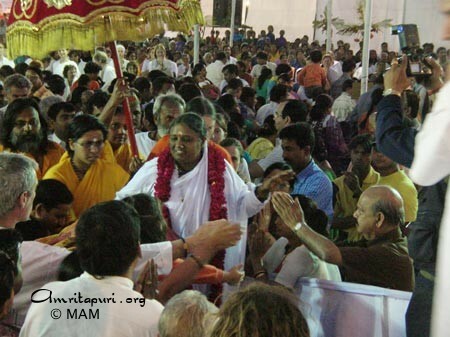 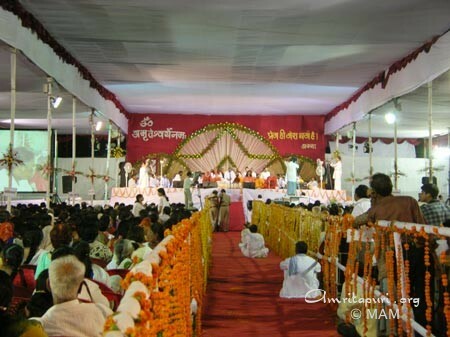 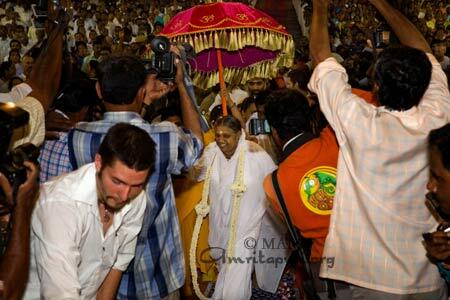 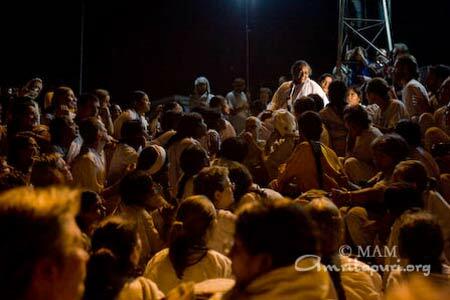 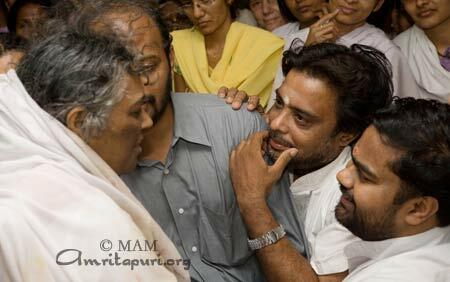 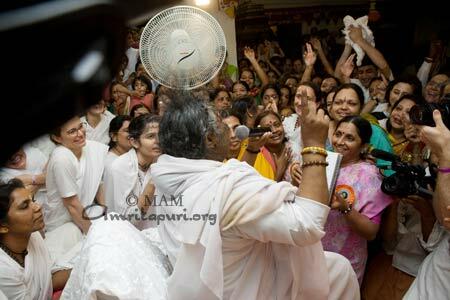 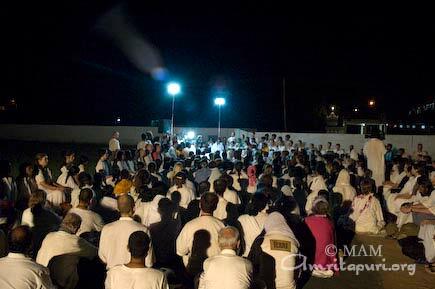 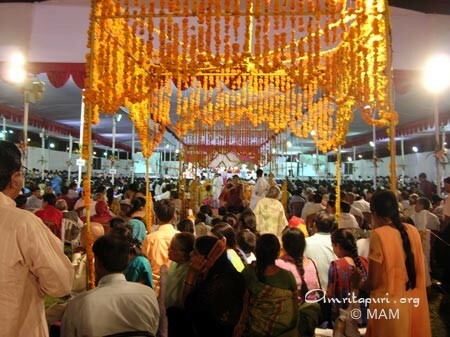 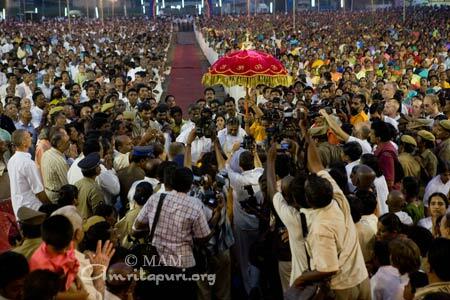 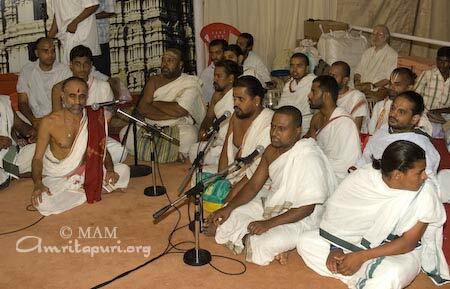 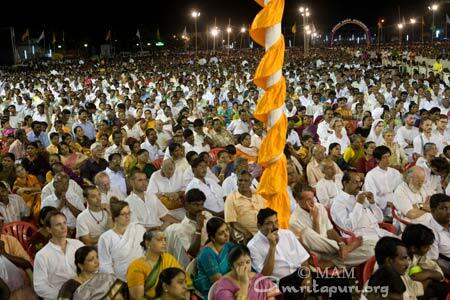 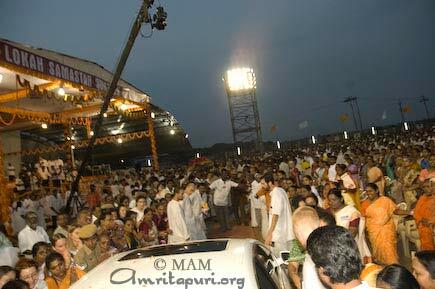 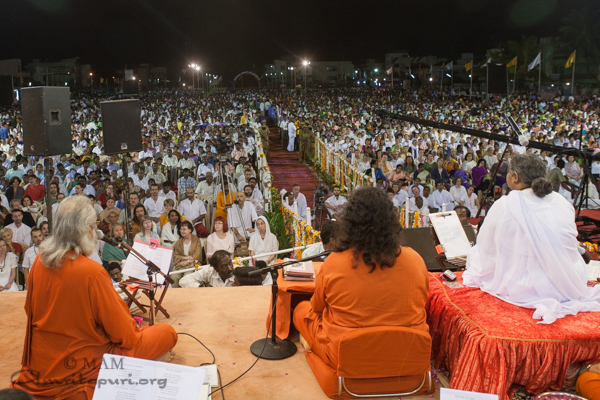 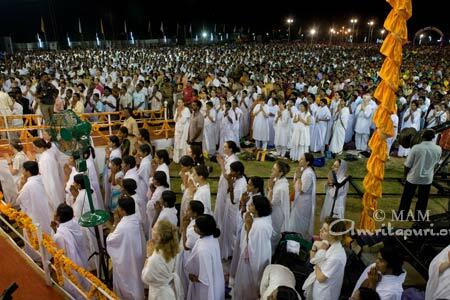 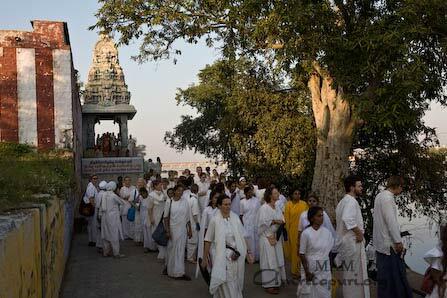 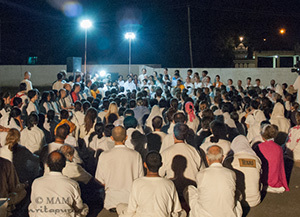 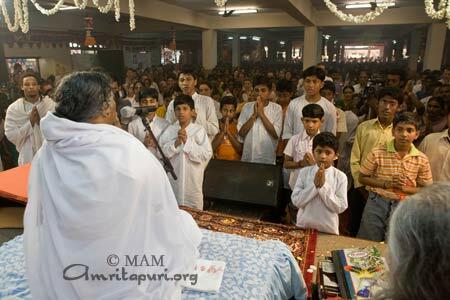 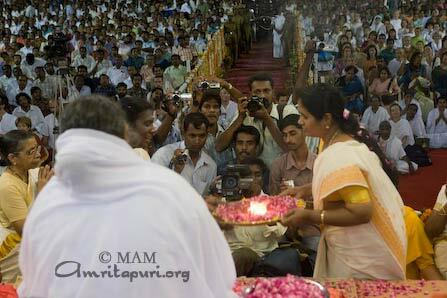 After the bhajans, Amma gave a request for the people to come peacefully for darshan. 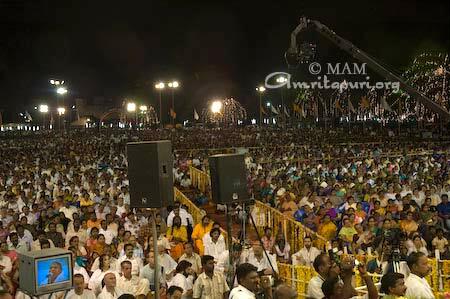 After this was translated in Tamil, Amma added that four years ago, the crowd was too anxious to get darshan, making it difficult to keep order. 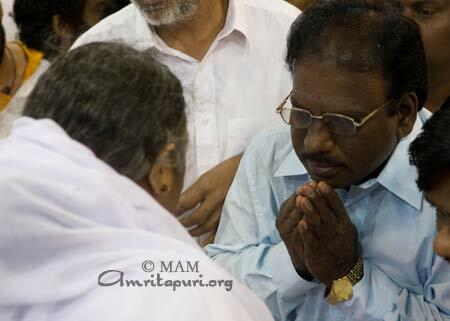 Even though Amma said this, the start of darshan was as she hinted, with a big rush. 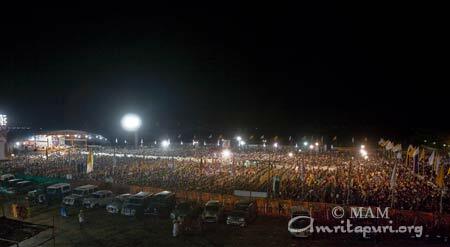 However, the crowd slowly calmed down, and now continues to go on orderly as we post this. 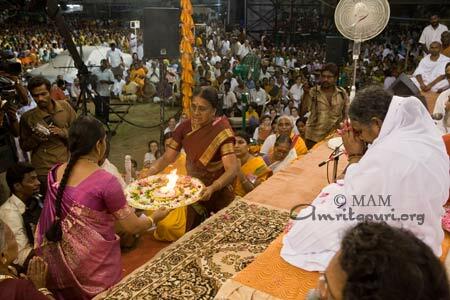 On the way to Pondicherry, Amma stopped along with the traveling devotees at the convergence of two holy rivers, the Bhavani and Kaveri. 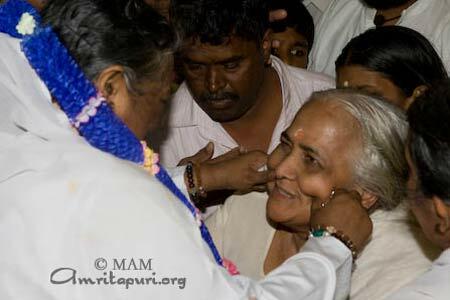 Amma used to visit here regularly in between stops of the India tours, but it had been more than three years since the last one. 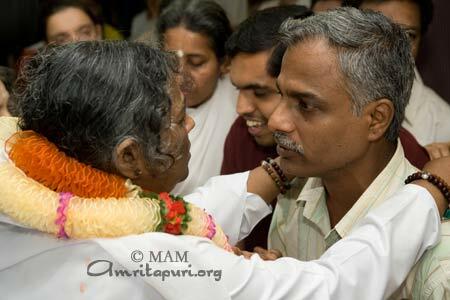 Once, when Amma and the residents stopped here, there was no food to distribute as prasad, so Amma herself concocted a special kind of rice gruel, with mung bean and shredded coconut. 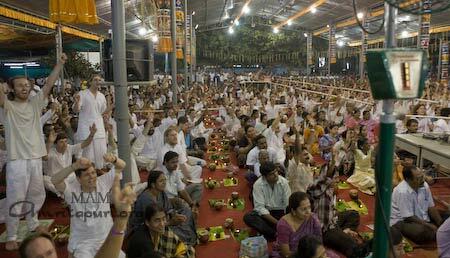 In honor of the river, this dish was named ‘Bhavani kanji,’ and is served for dinner at the ashram on Tuesdays. 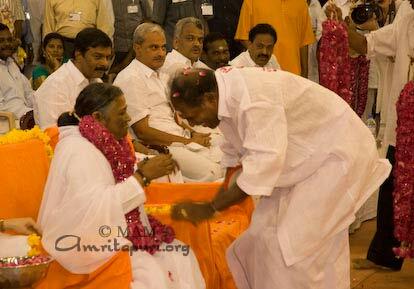 On this occasion also, Amma started distributing plates of prasad after sitting down. 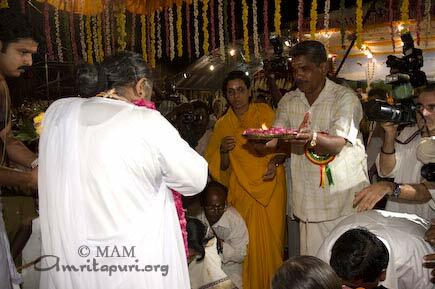 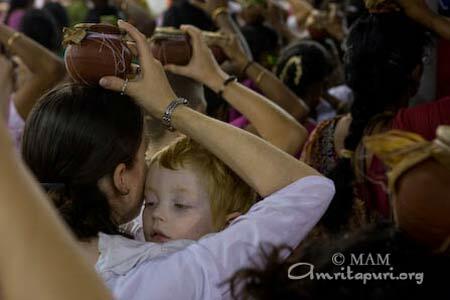 Many devotees passed their personal plates with names written on them to recieve the prasad, but this created some confusion. 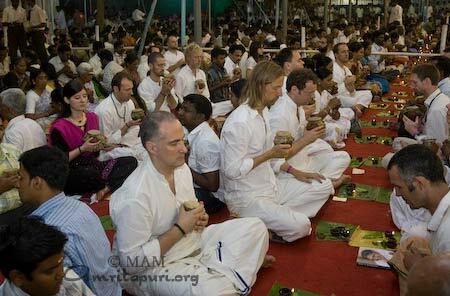 When the plates came back, nobody knew which plate goes to who. 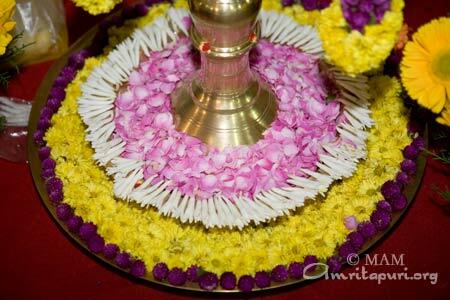 One person yelled out, ‘Linda! 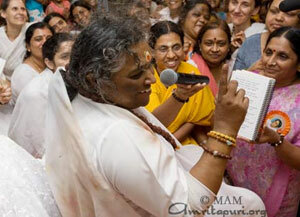 Where’s Linda?’ Another ‘Abhaya? 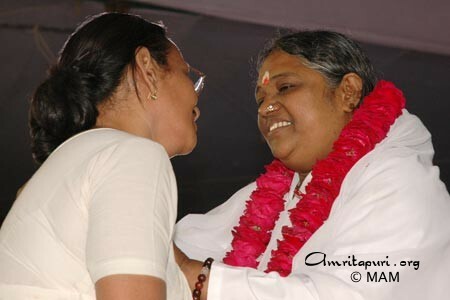 Abhaya?’ Seeing this confusion, Amma simply laughed, and began singing some of the newly tuned Tamil bhajans, with only the accompaniment of a brahmacharini’s voice and handclaps. 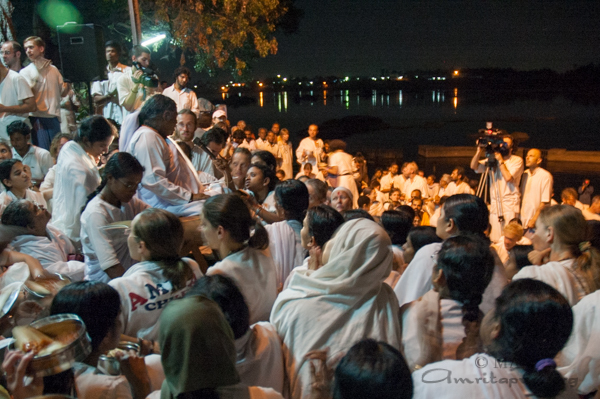 In a way, one can say that this is a convergence of three rivers. 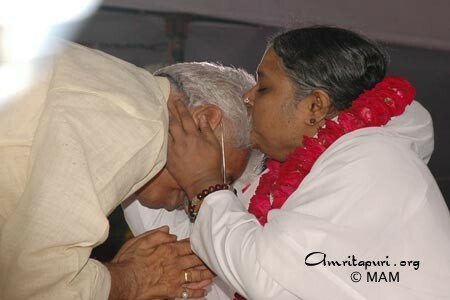 This is because Amma often says, ‘Amma is a river. 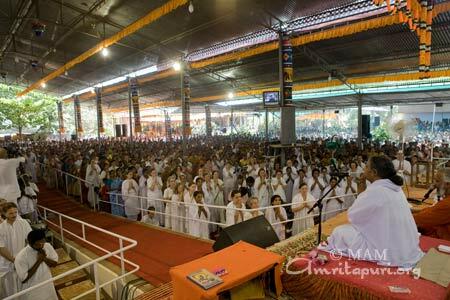 My nature is to simply flow.’ It is the devotee’s goal to merge into that flow, which is the real ‘samgamam,’ or convergence. 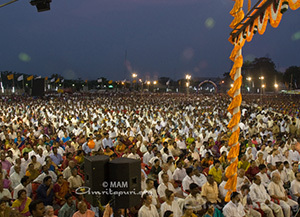 The weather during the programs was unique, in that the days were severely hot, and the nights severely cold. 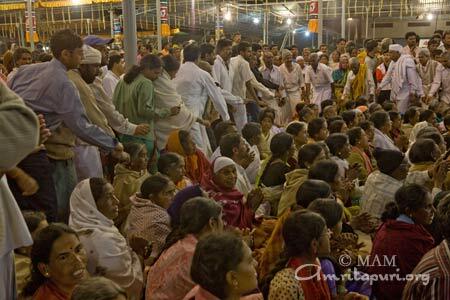 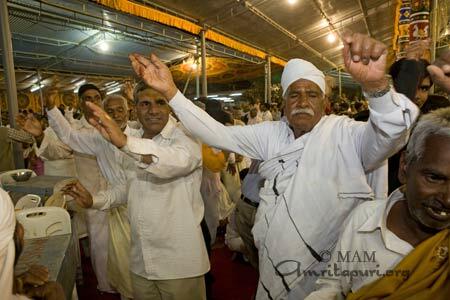 At nighttime, the devotees could be seen with their hats, jackets, and scarfs. 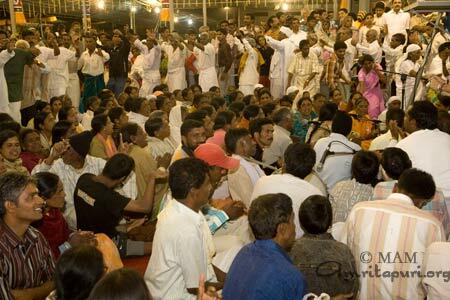 Meals were cooked and distributed for free to over 20,000 people, three times a day. 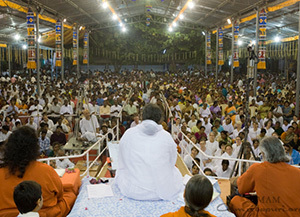 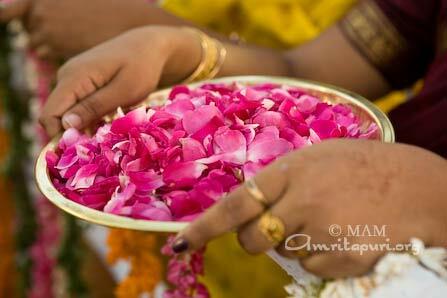 On the second day of programs, pujas were held. 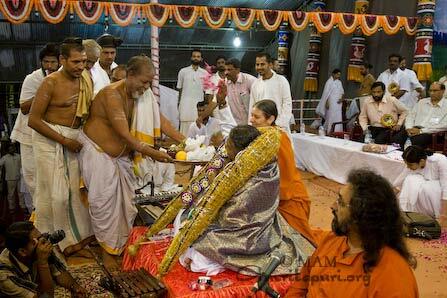 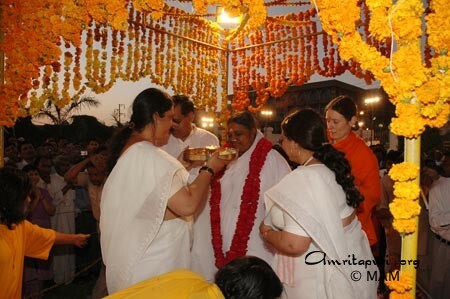 The Sani puja was led by Amma herself. 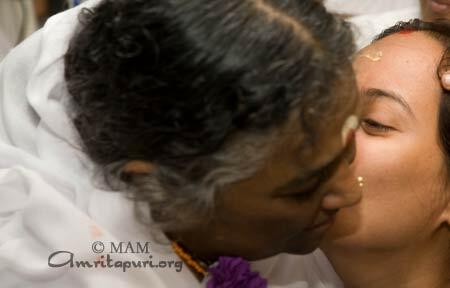 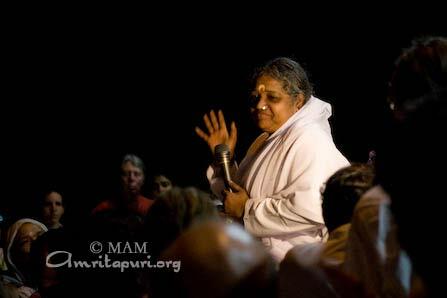 In Amma’s satsangs, she spoke about the need for patience in family relationships, about how to confront and overcome periods of suffering, and about the need to cultivate humility. 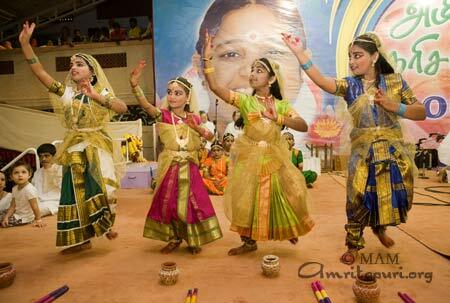 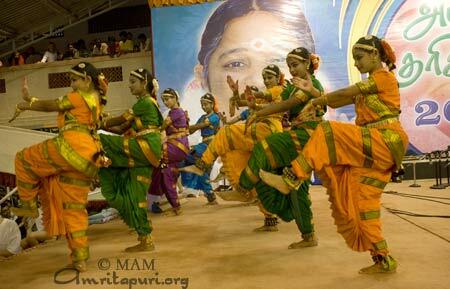 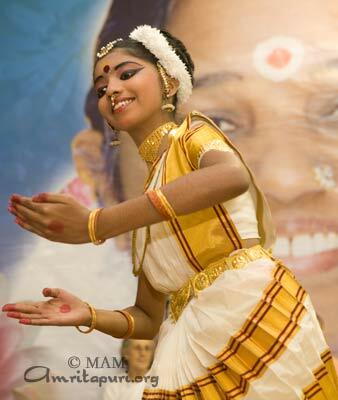 There were also cultural programs by the students of Amrita Vidyalayam. 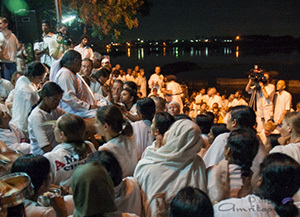 On the way from Kovai, Amma and the group stopped at Bhavani river. 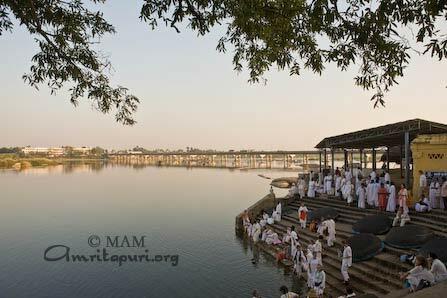 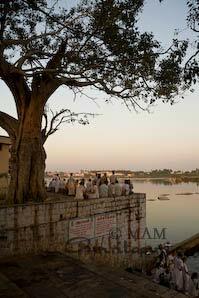 This sacred spot is the convergence of two rivers, Kaveri and Bhavani, called Bhavani Sangama. 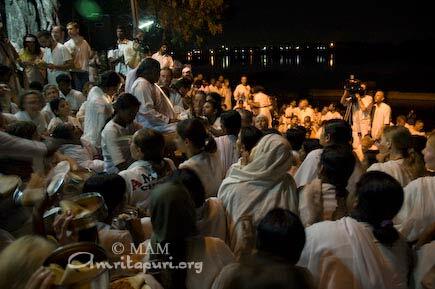 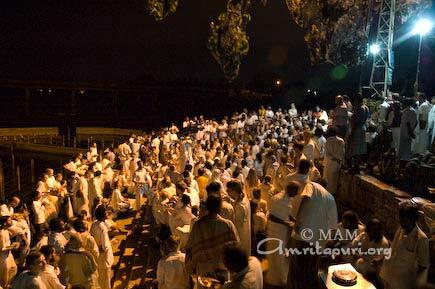 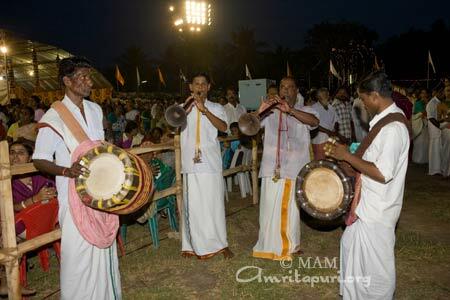 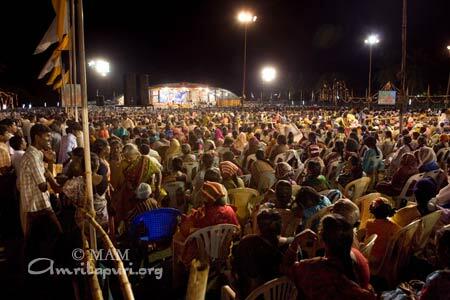 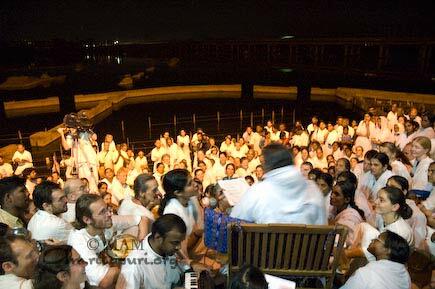 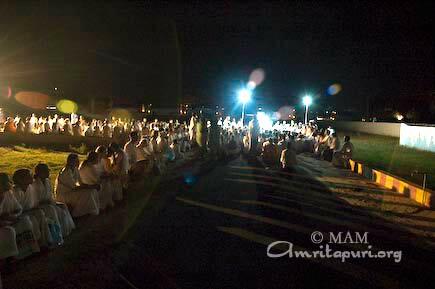 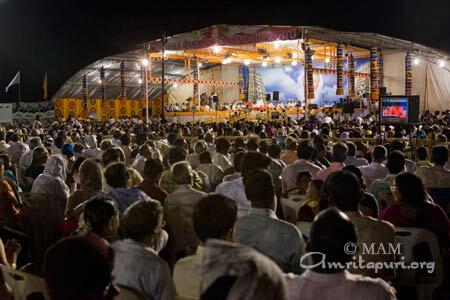 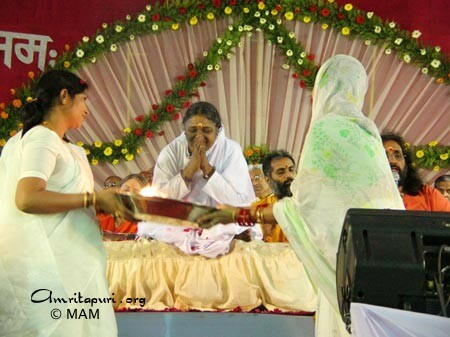 Sitting on the banks, facing the Bhavani river Amma sang few new bhajans, had satsang and Amma distributed dinner prasad to all.